Description: T. pennigera may grow to a length of 30mm. The body is translucent white in colour with tiny orange, yellow and black spots (the orange spots are usually larger than the black ones). The flared rhinophore sheaths are unusual in that they do not completely encircle the rhinophores but rather they envelope them. The branchial plume is arranged in the shape of a horse-shoe. Just behind the gills there is a pair of glandular processes that are defensive in function. 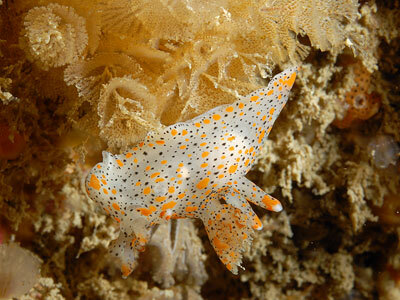 Habitat: This animal feeds on the bryozoan Bugula plumosa, often it is inconspicuous in its natural habitat due to the disruptive camouflage of the orange and black spots. The untidy, narrow, white ribbons of spawn are often the best clue to its presence. Distribution: Occurs in the south and west of the British Isles, extending up the English Channel to the Isle of Wight and up the west coast of Ireland as far as Portrush, Co Antrim. Also recorded south to the Mediterranean. 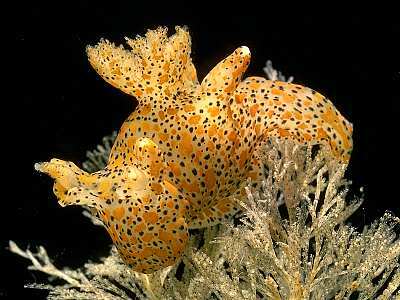 Similar Species: The black-spotted form of Polycera quadrilineata has been mistaken for T. pennigera but the lack of rhinophore sheaths in Polycera should rule out this error. White with orange and black spots. Picton, B.E. & Morrow, C.C. (2016). Thecacera pennigera (Montagu, 1813). [In] Encyclopedia of Marine Life of Britain and Ireland.